The Research Library for the History of Education (Bibliothek für Bildungsgeschichtliche Forschung, BBF) is an international research library and archive. The Research Library for the History of Education (Bibliothek für Bildungsgeschichtliche Forschung, BBF), founded in Berlin in 1876, is an international research library and archive, which has been part of the German Institute for International Educational Research (DIPF) since 1992. It is the largest German library specialised on education, holding more than 730,000 items, 1,800 running meters of archival material and a comprehensive database and portal service.The library has thus developed into a service institution and center for research on the history of education. The BBF collects printed publications and all types of electronic publications in the field of educational history in German-speaking countries. It retrospectively adds to its collection of primary and secondary sources and serves as an archive for institutions relevant to the history of education. Owing to its singular collection, the BBF represents the domain of ”history of education in the German-speaking countries“ in the system of special subject field libraries funded by the DFG (Deutsche Forschungsgemeinschaft). The BBF thus belongs to the small number of 40 highly specialised German libraries that together form the distributed national research library. 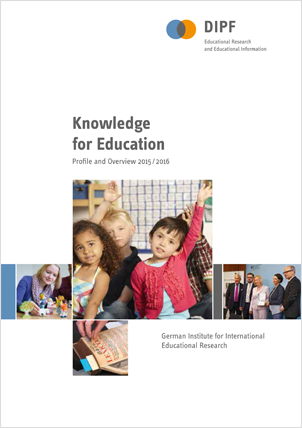 The archive holds files from distinguished pedagogical institutions and organisations (e. g. from the German Educational Research Association, DGfE) as well as collections that are relevant to the history of education and numerous personal trusts and papers from pedagogues – e. g. Friedrich Fröbel, Berthold Otto and Adolf Reichwein. The BBF indexes its archive and library holdings in customised databases that are openly accessible on the internet and it is integrated into several supra-regional and national library gateways and subject portals, among them the services offered by the Information Center for Education. The scientific director of the BBF also holds a Professorship for History of Education which is jointly appointed by DIPF and the Humboldt-Universität zu Berlin. Research activities are closely linked with the library and archival services offered to the scholarly community. For instance, the BBF realises computer based edition projects; it digitizes sources and renders them openly accessible. Last but not least, virtual research environments are developed at the BBF. Conferences and exhibitions, which are open to the general public, also contribute to shaping the profile of the BBF.